"Raindrops on roses and whiskers on kittens" might not make it to the top of my list, but that movie was a favorite from childhood and I still enjoy watching it. I'm allergic to cats and dogs that have a lot of fur, but I love watching my kids enjoying their pets even if they make me sneeze. Sunday we shared memories. I remember one morning, maybe it was the first day of school that year, it was definitely a school day. My mom asked my sisters and I our favorite foods. She then prepared them, and we ate bacon and French fries for breakfast! Add cheesecake and you've got my favorite foods. Today is National French Fry day, and I'm planning French Fries for lunch, but with chicken as we currently don't have bacon or cheesecake. :) Another favorite food is York Peppermint Patties. My daughter made me homemade ones for Christmas (and again since then) and they are even better than the original ones. 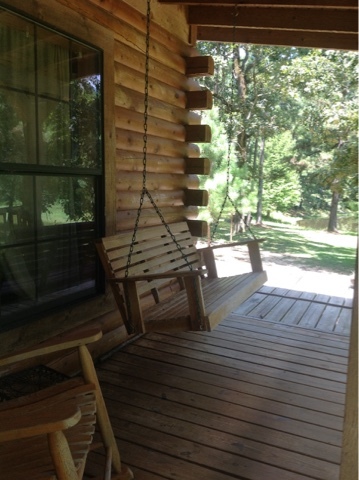 My front porch swing is one of my favorite places. I like old things. Vintage, antique, give it a pretty name if you wish, but I like things with stories. One of my Grandmother's rolling pins is in my kitchen and one of her Bibles is by my bed. She is often on my mind, but those two tangible reminders are of two things I especially associate with her. We made poutine for French Fry Day. :-) Love your list of favorite things! Kym, When I met my Canadian sister in law she made poutine, and I knew what it was because of you previously sharing about it on your blog. Thank you!